My brother can't drive a car. So when he need to go to the barber, I'm the one who have to drive him there. When we arrived, we both found this shocking picture. Is that our president? Yea it is. But he looks stupid and cheap. 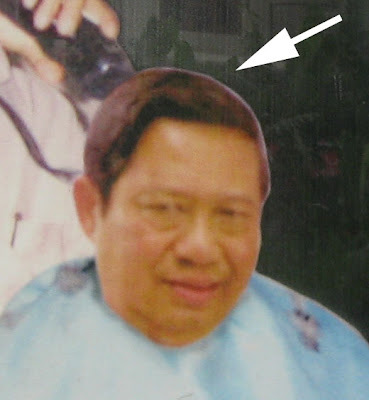 How can the most popular guy on this country cut his hair in this cheap barber shop? Lets ask that IT expert (yea right doh!) Roy Suryo, whether is it a fake picture or not. Then let's wait. Will the police arrest the barber because of this, like when they arrest my brother 3 years ago? I don't think so. You know why? 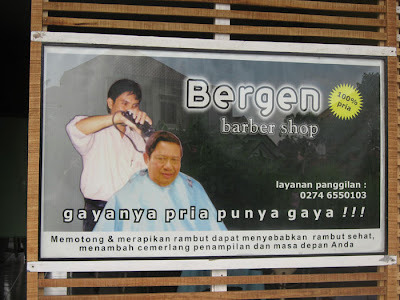 Because the barber didn't put Roy Suryo's face on that picture.